Social media and mobile savvy, small to medium sized businesses (aka SMBs) provide useful insights for all marketers because they’ve more limited resources than their larger competitors. As a result, they develop cost-effective marketing that translates to measurable revenue generation. Using social media and mobile, SMBs leverage their lower headcount and smaller budgets to build brand awareness, expand market share and increase customer loyalty. Don’t believe me? 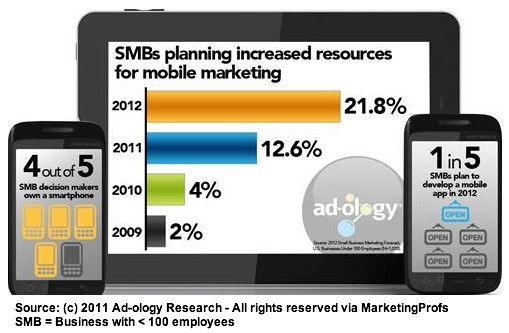 The recent report from Ad-ology Research shows a distinct difference in how SMBs use social media and mobile marketing. It defined an SMB as a business with fewer than 100 employees. 21.8% of SMBs plan to increase mobile marketing, a significant increase from last year’s 12.6%. Four out of five SMB decision makers have a smartphone. One in five SMBs surveyed planned mobile app development in 2012. One out of ten SMB decision makers won’t use social media in 2012, less than half the proportion who didn’t use social media in 2011. 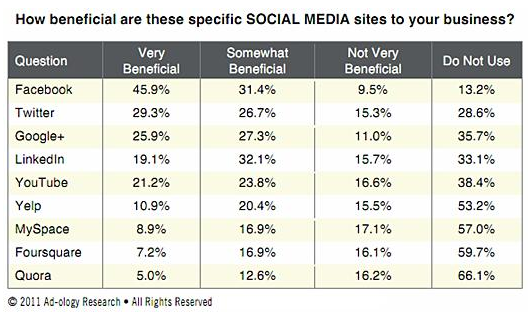 Half of SMBs planned to spend more resources, time and/or money, on social media next year. While SMBs focus on keeping day-to-day businesses going, they must ensure they have the foundation to compete against their larger competitors. Here’s a twenty-one point, small and medium size business, social media and mobile marketing checklist. Any marketer can (and should) use it to maximize results. Monitor the chatter about your business. Use the best brand monitoring software you can afford. At a minimum, track what’s said on social media and local offerings such as: blogs and review sites like Yelp, TripAdvisor and Zagats, niche communities and discussion groups. ACTIONABLE MARKETING TIP: Respond where appropriate but don’t be defensive. Don’t let negative comments go unanswered. Set measurable business goals. Determine what you can and/or need to accomplish. ACTIONABLE MARKETING TIP: Be realistic in your expectations. For example, chances are you can’t double your results from last year. Know your customer base. Understand who really buys from your organization and what their hot buttons are. ACTIONABLE MARKETING TIP: Createmarketing personas to help meet your customer’s needs. Strut your business’s stuff. Does your business lend itself to visual presentation? If so, create photographs and video to reduce perceived risk for prospects. For example, beauty salons and tailors can show before and after photographs. ACTIONABLE MARKETING TIP: Get patrons’ permission or offer a free bonus to incent customers to participate. Don’t overlook the power of YouTube, Flickr and Tumblr. Distribute useful information. Help customers use your product. For example, a food specialty shop can offer recipes and menus for using new products while clothing shops can show how to make wardrobes and living areas snazzy using its current product. ACTIONABLE MARKETING TIP: Provide easy-to-use information customers can follow. Don’t give them a recipe only a five star chef could follow. Tap into customers’ passions and/or hobbies. Interpret interests broadly. Think fun. With hobbies and special interests, customers may make different spending tradeoffs. ACTIONABLE MARKETING TIP: This translates to helping people doing and/or sharing their hobbies and special interests using photographs, videos, and blogs. Entertain customers and the public with fun content. Break information into bite size chunks of content. This information doesn’t have to be your business’s main focus. ACTIONABLE MARKETING TIP: Have a content focus that’s easy to do regularly such as a tip of the day that works on social media platforms like Twitter. Create reasons for people to gather at your business location. In a social media connected world, give people a reason to congregate in-person such as wine store tastings or cooking classes at food specialty shops and/or restaurants. It can provide another revenue stream. ACTIONABLE MARKETING TIP: Use Meetup.com to organize the community and post comments. Where appropriate, share the event via Facebook, Flickr or Tumblr. Develop a content strategy. Integrate your social media and mobile marketing strategies into an editorial calendar to ensure your promotions, products and content drive social media, mobile and sales. ACTIONABLE MARKETING TIP: To help content creation, include topics, promotions and products to ensure you don’t get stuck thinking of what to write because customers expect regular servings of information. Make content search-friendly. Create content related to your products and use relevant search keywords. ACTIONABLE MARKETING TIP: Include tags and text for non-text content such as photographs, video and audio to aid findability. Create a mobile presence. Since shoppers reach for their smartphone to get product research and purchase, have a mobile website. ACTIONABLE MARKETING TIP: Focus your mobile website on one major function. Display your physical address (linked to a map) and phone number prominently. Incorporate a tailored call to action. Understand customers need to be encouraged to take action. Help them. ACTIONABLE MARKETING TIP: Include a unique promotion code in each piece of content to track results and know what works. Include targeted mobile search campaign. Mobile search differs from regular search. Mobile search often happens closer to purchase. ACTIONABLE MARKETING TIP: Track and test your mobile search campaign to determine what’s most effective. Leverage other people’s audiences. Does another business have a customer base that needs your expertise? If so, offer your content to them. ACTIONABLE MARKETING TIP: Use guest articles or webinars to give advice to their customers and get yourself introduced to another audience. Join targeted or niche communities where prospects and customers naturally congregate. Play where prospects and customers are to raise visibility. ACTIONABLE MARKETING TIP: Contribute useful content or offer your store for real life meetings. Read blogs covering your area of expertise. Actively comment and add to the conversation. ACTIONABLE MARKETING TIP: Write guest posts to share your knowledge and broaden your audience. Promote your social media efforts online and offline. Market your social media presence. Just because you know about it doesn’t mean your audience does! ACTIONABLE MARKETING TIP: Include your website, e-mailings, direct mail, local advertising, in-store postings, flyers, business cards, and correspondence. Socialize your offering. Ask visitors, prospects, and customers to share their experiences and your content. ACTIONABLE MARKETING TIP: Include calls for sharing on the major social media platforms. Integrate social media efforts offline. Provide retail prospects with offline social media experiences through an old-fashioned bulletin board with photographs or handouts containing how-to information. ACTIONABLE MARKETING TIP: Use flyers, receipts and shopping bags to promote your social media activities. Track results across marketing promotions. While many SMBs have less sophisticated systems, it still important to monitor your results. Here are the top social media marketing metrics to help you. ACTIONABLE MARKETING TIP: Compare your results to your budget and your previous year’s performances and calculate variances. What’s important for your business is developing a set of social media and mobile strategies that yield measurable results. These marketing tactics should be broken into bite-size tactics you and your team can execute efficiently. What other marketing strategies have you tried that were successful? BTW–If you enjoy this blog’s social media advice, I’d appreciated it if you would take a moment to nominate this blog, https://heidicohen.com for Social Media Examiner’s 3rd Annual, Top 10 Social Media Blogs by clicking on this link and saying why you like the blog in the comment section. Thank you for your support. Tags actionable marketing, Mobile, small business, SMB. Bookmark the permalink. 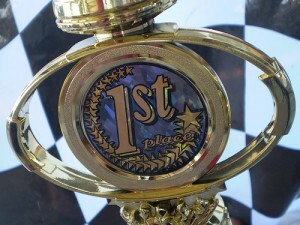 ← Do You Know These 5 Secrets to Compelling Content?